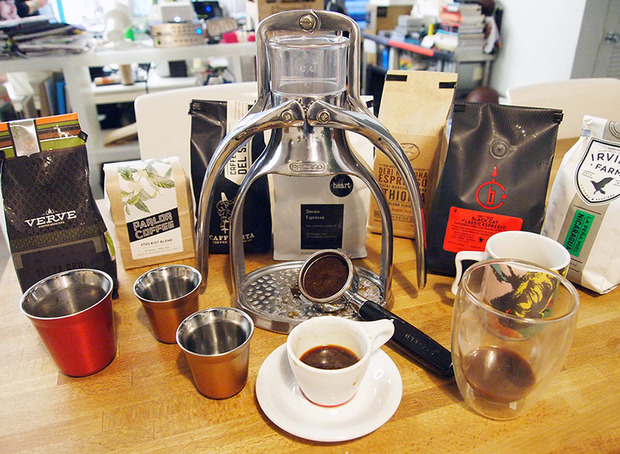 Seven Outstanding Espresso Blends | Gornado | Join in my journey around the world to find the Best Espresso! While the legitimacy of these abundant “national” holidays that tend to pop up arbitrarily is definitely in question, we couldn’t pass up tomorrow’s opportunity—National Espresso Day—to pay homage to one of the purest ways to prepare coffee: espresso. The thick, concentrated brew packed into a tiny cup for a bold—not bitter—flavor is the default way to take coffee in Europe but sometimes can be more of an afterthought stateside, as it’s blended with milk in popular drinks like caffè lattes and or thinned down a tad in Americanos. Returning to the standard classic, we spent this week grinding, tamping and extracting up a storm in our office, sampling beans from roasters around the country. We put together a selection of our favorite espresso blends, including long-loved go-tos as well as new offerings this season, to add an intense kick to our day during the upcoming winter months. Cafe Grumpy, which was founded in Brooklyn in 2005, roasts their beans in-house in Greenpoint [where Lena Dunham’s character also works in the HBO series Girls] and their seasonally-changing Heartbreaker Espresso blend has been a longtime CH favorite. Their newest single origin espresso from the Sidama province in Ethiopia, however, may just change that. Cafe Grumpy started serving the washed Deri Kochoha as a brewed coffee selection and as espresso (which has a slightly different roast profile) this September. As an espresso, it’s very earthy, rich and dense in a juicy way. 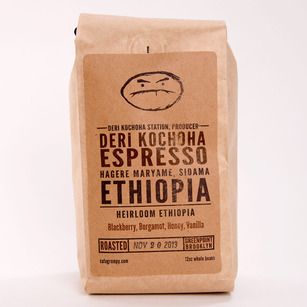 Deri Kochoha retails at $18 per 12-ounce whole bean bag, available on their website. 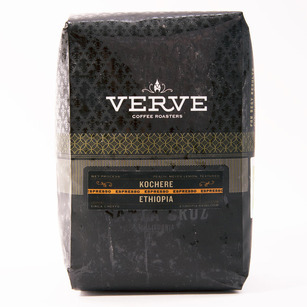 Put aside Verve‘s famous Streetlevel Espresso and try out their newest single origin espresso offering, Kochere SOE. The Santa Cruz, California-based small-batch roaster (founded in 2007) sources the beans from the Yirga Cheffe and Sidama regions in Ethiopia as well, but produced by the Kochere cooperative. It’s citrus-y but also has tropical fruit-like qualities that evoke guava or papaya; sweet and smoky, robust but not overbearing—with zero sourness. A 12-ounce bag of Kochere SOE retails for $18 online. Be sure to check out Verve’s collaborative pop-up at 33 Grand St in Williamsburg with Rudy’s Barbershop and Poler. 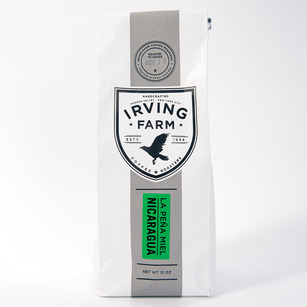 While Blackstrap is their signature house espresso blend, NYC-based Irving Farm serves their new single origin coffee La Peña Miel as an espresso in their cafés. The beans are from Ocotal, in northern Nicaragua, where farmer Luis Alberto Ballardez experiments with some sub-plots in his mill. He planted the Yellow Catuai variety and used a special “Miel” (or “honey”) process to accentuate its sweetness; the fruit’s skin is removed but its mucilage is left on to dry—allowing the sugar to be absorbed into the seed and resulting in a sweeter coffee. We found it to be bold, zesty and full-bodied—yet clean—and, like a Latin lover, smooth and hot. Consider it a wine-like shot of espresso. La Peña Miel retails for $17 for a 12-ounce bag online. 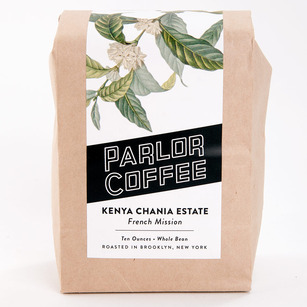 Parlor Coffee is the new kid on the Brooklyn block: Started last year in October 2012, Parlor has now moved their roasting operations into the Pulley Collective in Red Hook and have plans to open a tasting bar at their new roastery in Brooklyn sometime next year. The beans are from Kenya’s Central Province, where French missionaries brought the original bourbon variety to the area in the late 1800s. The aroma that emanates from the bag alone is almost orgasmic, with notes of dark chocolate, baking spice and grapefruit. As it’s a bit acidic, it’s perfect in a cappuccino or latte, as the milk would cut it toothiness, but it’s an overall nice coffee flavor. Pick up a 10-ounce bag for $14 at their pop-up espresso bar in Persons of Interest barbershop in North Williamsburg; stay tuned as their e-shop is expected to open soon. Seattle-based independent coffee roasting company Caffe Vita has been known for its rigorous standards for environment and social sustainability, as an early proponent of direct trade, rather than fair trade. 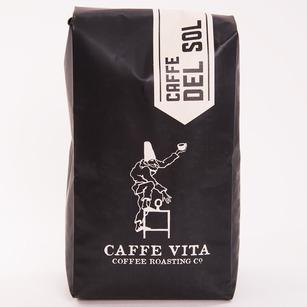 Caffe Del Sol is their signature espresso blend—it’s smooth for an espresso; unoffensive and silky with dark chocolate notes and finishing to a sweeter caramel. It would reach its peak potential with a dash of milk in a macchiato. A 12-ounce bag of Caffe Del Sol can be purchased for $13 online. Caffe Vita will also offering a new holiday blend of Yemen and Java coffee in limited availability this season. Based in southwest Wisconsin and named after its neighboring scenic river, Kickapoo Coffee is a micro roaster founded in 2005 that is serious about fairness to farmers, choosing to purchase the majority of its beans through direct trade from small-scale producers. Their Organic Ethiopian Natural Process also sources their beans from Banko Gotiti village in the Yirga Cheffe region, which are certified organic by MOSA Fair Trade Cooperative. In the light roast, we tasted a bright richness with a slight hint of spice and discovered an earthy, woody flavor, evoking a campfire in the middle of a still winter day. 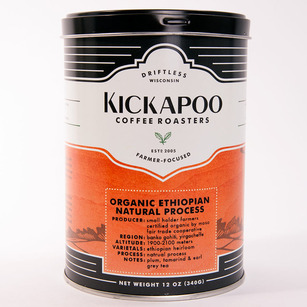 To further their sustainable-minded mission, Kickapoo sells their coffee in 12-ounce reusable, recycled and recyclable steel cans. Pick up a can of Organic Ethiopian Natural Process for $16 online. Last but not least, we leave you with our go-to espresso blend. Chicago-based Intelligentsia, the cult coffee favorite, has offered their signature Black Cat Classic Espresso (named after the “pursuit of something we will never catch: the perfect espresso”) since the very beginning. Black Cat Classic (which also comes in Analog, Organic and Decaf versions) is a direct trade coffee that merges beans from Costa Rica and Brazil. Deep, dark, rich and on the bitter side, this blend is satisfying for espresso-loving purists and carries a smoke and nuttiness. Despite its full-bodied taste, Black Cat remains balanced, teetering on the edge of overpowering and pulling back at just the tail end of the finish. Black Cat Classic Espresso is $15 per 12-ounce bag online; Intelligentsia is now offering free shipping on all orders.